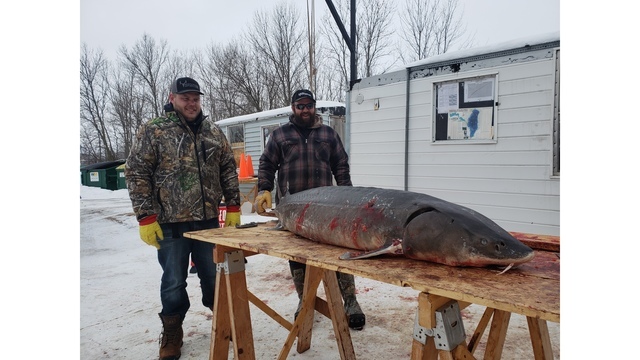 LAKE WINNEBAGO, Wis. (WFRV) - The 2nd weekend of the 2019 sturgeon spearing season on the Winnebago System is in the books. 63 sturgeon were registered in total, including 43 harvested from Lake Winnebago and 20 from the Upriver Lakes. The largest Sturgeon of the day came from Kenny Swanson of Neenah. The fish weighed 130 pounds. On Sunday, they reached the 90 percent trigger for adult females speared on the Upriver Lakes. This means the season will close there on Monday, Feb. 18, at 1 p.m.
Sturgeon spearing on Lake Winnebago is expected to last the full season.